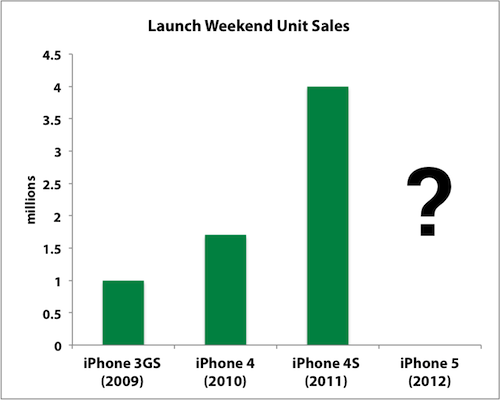 Motley Fool Australia » Investing » How many iPhone 5 units can Apple sell in 9 days? In just a matter of days, Apple (Nasdaq: AAPL) is going to unveil its iPhone 5. The Sept. 12 date that was making its rounds through the iRumour mill proved to be spot-on, with Apple confirming that date last week. I think it’s then safe to say that the Sept. 21 launch date that’s been speculated will similarly turn out accurate. It just so happens that Apple’s fiscal fourth quarter closes at the end of the September, meaning the iPhone 5 will only be on sale for about nine days before the accountants take their turn tallying up the final score for fiscal 2012. As we know, last quarter saw a notable sequential drop in unit sales as rumours and speculation over the new model reached a fever pitch, and Apple technically fell short of Street estimates on iPhone unit sales. They dropped 9 million to “just” 26 million, and while the iPad was able to compensate for some of this as it was just upgraded, the drop-off was still severe. Those aren’t lost sales, but rather just delayed as consumers await the iPhone 5. Right now, the Street is homing in on iPhone unit sales estimates between 22 million and 23 million. That would represent growth of between 29% and 35% relative to the 17.1 million units sold a year ago. With Apple just recently confirming the date, it’s hard to gauge whether these analysts are factoring the iPhone 5 launch into their models. You also need to consider some context to that year-over-year comparison. Last year, the iPhone 4S was unveiled and launched in October, right after the fourth quarter closed, so the entire fiscal Q4 2011 was being hurt by anticipation of the new models. This year, the iPhone 5 will be unveiled and launched in September, right before the fourth quarter closes, so Q4 2012 will only be partially affected by those same purchasing delays but should also get a little pop for nine days once the device is unleashed upon the world. Longtime Apple analyst Gene Munster with Piper Jaffray has come out with revised estimates with the presumption that the device is indeed launched on Sept. 21. Munster pegs fourth-quarter unit sales between 26 million and 28 million, with most of that jump happening in those final nine days of the quarter. He believes Apple may sell anywhere from 6 million to 10 million iPhone 5 units within that week alone. Let me repeat that: potentially up to 10 million units in one week. That’s a massive number that deserves some exploration. Hitting that target would be more units than sold in all of fiscal Q3 2010 and would be more than 25% of Apple’s current quarterly unit record of 37 million in fiscal Q1 2012. In one week. Before you brush aside Munster’s figures as unrealistic optimism from an uber-perma-bull, remember that iPhone launch weekend unit sales have continued to progressively explode every year. The biggest jump was last year from 1.7 million iPhone 4 units to 4 million iPhone 4S units, more than doubling on an incremental upgrade. How do you think Apple will fare on arguably the biggest upgrade in the product’s lifetime? The potential curveball would be if supply constraints hold back Apple’s ability to meet demand. We already know that Qualcomm (Nasdaq: QCOM) is facing 28-nanometer constraints from Taiwan Semiconductor (NYSE: TSM) for its newest batch of baseband processors — the same ones expected to be in the iPhone 5. There have also been reports that Sharp has had some delays producing iPhone-bound displays. Sharp was supposed to start shipping screens at the end of August but ran into some manufacturing hurdles that have delayed production. The other two suppliers, Japan Display and LG Display (NYSE: LPL), would need to pick up the slack if Sharp dropped the ball. A recent report from Evercore Partners analyst Rob Cihra even found that iPhone supply constraints have been good for its stock performance over the past few years. Cihra thinks this points to customer loyalty since they don’t buy competing devices, and teases shareholders to fathom how good the numbers would be if all demand was met. While Apple is known for building hype and supply shortages also tend to do the same, the company has previously said it would never intentionally keep supply low for this purpose. I’m more interested in the holiday quarter. Next quarter will see the iPhone 5 on sale throughout its duration, and estimates go as high as 50 million units. At a conservative average selling price of US$600, that’s US$30 billion in revenue — more than all of rival Microsoft‘s (Nasdaq: MSFT) businesses combined. So how many iPhone 5 units can Apple sell in nine days? A lot.